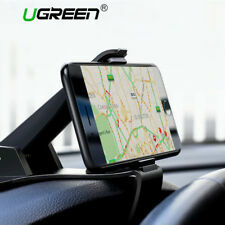 Ugreen wall mount phone holder can give your phone and tablet a safe dock while charging. It is the perfect storage solution for your iPhone when it is charging. ·Extension Cable. Audio Cable & Adapter. IPhone & iPad Cable. Phone & Tablet Cable. Android Phone & Tablet Cable. USB Type-C Cable. Audio Cable. Car Accessories Series. Phone & Tablet Accessories. Phone & Tablet Stand. Phone Holder & Stand. Bluetooth Receiver & Sender. Audio & Video. Organizer Accessories. Dashboard Car Phone Holder, UGREEN Dashboard Phone Mount, Car Mount HUD Display Safe Driving for iPhone X 8 7 6s, Samsung Galaxy S9 S8 Plus Note 8 S7 Edge S6 A7, LG G6 V20, Oneplus, Huawei Sony HTC, MOTO Phone. ·Extension Cable. Audio Cable & Adapter. Audio Adapter. ·USB Lan Adapter. ·Type C Cable. 3.5mm Audio Cable. ·M/M audio cable. 6.5mm Audio Cable. Does not interfere with cellular signal or phone's battery life. Utilizes 6 powerful magnet that holds onto your phone. Happy with your item?. One button quick install-release button. Adjustable swivel ball-joint provides 360 degrees rotation for different viewing angles. 1 x Universal car cellphone mount. 360 degree rotation for portrait or landscape viewing. Powerful vacuum suction cup base safely and securely mounts your device to the car windshield. Flexible gooseneck design allows the mount to be adjusted to the optimal viewing angle. Magnetic surface is made of soft rubber that prevent scratches on your phone. Uses 4 strong magnets that provides a secure mounting surface for you device. High quality and durable rubber base that can easily be clipped to almost all types of air vents. The mount uses a clip to hold on to the smartphone and a sticky pad and suction cup to attach it on the dash, windshield, air vent, or cup holder. Enhanced Easy One Touch mounting system locks and releases the device with just a push of a finger. Apple iPhone XS / XR / X. The clip grip holds your device firm and steady with or without a skin or case. Strong adhesive gel suction pad adheres to dashboard and windshield with ease. Rubberized Clip Grip. The iOttie Easy One Touch 2 provides a safe, versatile & stylish smartphone mounting solution. Samsung Galaxy S8 Plus S8 Edge S7 S6 Note 8 5. iPhone X 8/8s 7 7 Plus 6s Plus 6s 6 SE. Provides a secure grip of your phone for easier texting, photo taking and holding. Adheres to most phones and cases while letting you switch up the position to your liking. Belkin Car Vent MountModel No: F7U017BT. Have your smartphones securely mount to your car's vent using Belkin Car Vent Mount! iPhone 7 Plus iPhone 7 iPhone SE iPhone 6s Plus iPhone 6s iPhone 6 Plus iPhone 6 iPhone 5c iPhone 5/5s Galaxy S7 Galaxy S7 edge Galaxy S6 Galaxy S6 edge Galaxy S5 LG G5 Nexus 5X Google Pixel Google Pixel XL Huawei P9 Huawei P8 Huawei nova HTC 10 Microsoft Lumia 950 iPhone 4/4S iPhone 3/3GS iPhone Galaxy S3 Galaxy S4 Galaxy Note Galaxy S II Huawei P10/P10 Plus LG G6 Galaxy S8 Galaxy S8 LG V20.